Wake your people up with the aroma of carne asada grilling. Jace’s Breakfast Burritos will make everyone’s weekend! My youngest brother is named Jace. I was almost 14 when he was born, so we lived very different childhoods. He’s closer in age to my kids than I am to him. Both my brothers went to college near where we live now, so we had the opportunity to live in the same time town and sometimes in the same house over the years since we moved back to California. But, it wasn’t until this summer that Jace made me his famous Breakfast Burritos. Wow! You are going to want to make these this weekend! Jace and his girlfriend, Pauline, came to visit this summer. He told me he had plans. And no one has really been successful at deterring Jace from his plans. So I went with it. I’m so glad I did! I was greeted the next morning by the aroma of carne asada cooking on the grill. If that has never happened to you, let me tell you, it’s a beautiful thing. Fans of The Regular Show will remember the episode of the Every Meat Burrito. This is kinda like that. Only breakfast style. And there’s no alpaca. 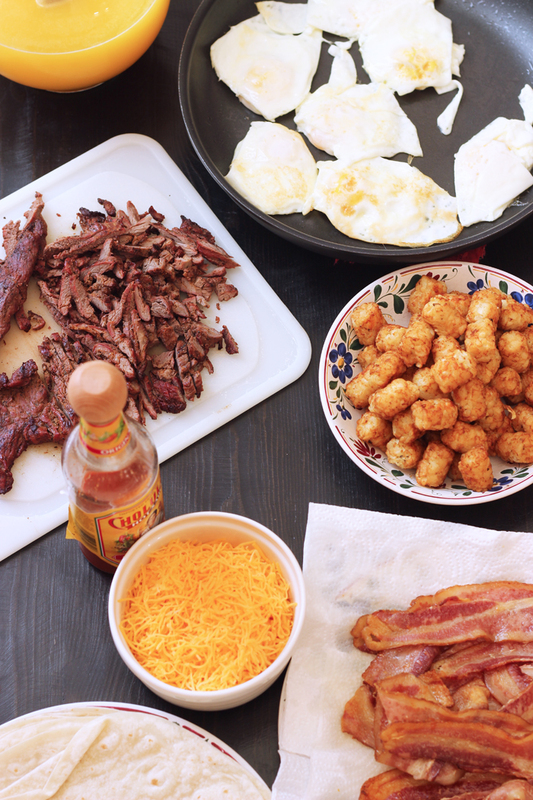 For his breakfast burritos, Jace laid out a variety of fillings: grilled carne asada, bacon, sausage, tater tots, eggs fried over-easy (in bacon grease), shredded cheddar cheese, hot sauce, and guacamole. Yum! Sausage and Guacamole not pictured. I would never have thought to put all these fillings in breakfast burritos, but trust me when I say it totally works. And I wish I had some right now. Carne Asada is a Mexican-style, thinly sliced, marinated cut of beef. It’s usually made with skirt steak. I’d never heard of it until I met my college roommate, Laura. My parents always ordered carnitas, so I didn’t know about carne asada. I texted Laura for a homemade marinade recipe last week. I will update you soon. Until then, know that you can buy marinated carne asada at Mexican markets, Trader Joe’s, and some grocery stores. I’m gonna guess that it’s location-dependent. Let your people fill their breakfast burritos however they like and then crisp them on the griddle. Get the biggest tortillas you can find because you’re going to want to fill these breakfast burritos. Trust me. Bake the tater tots according to package directions. Cook the carne asada on a hot grill until cooked through. Chop coarsely and cover to keep warm. Cook the bacon in a skillet or in the oven until done. Cook the sausage in a skillet until no longer pink. Fry the eggs in a hot skillet according to your preferences. 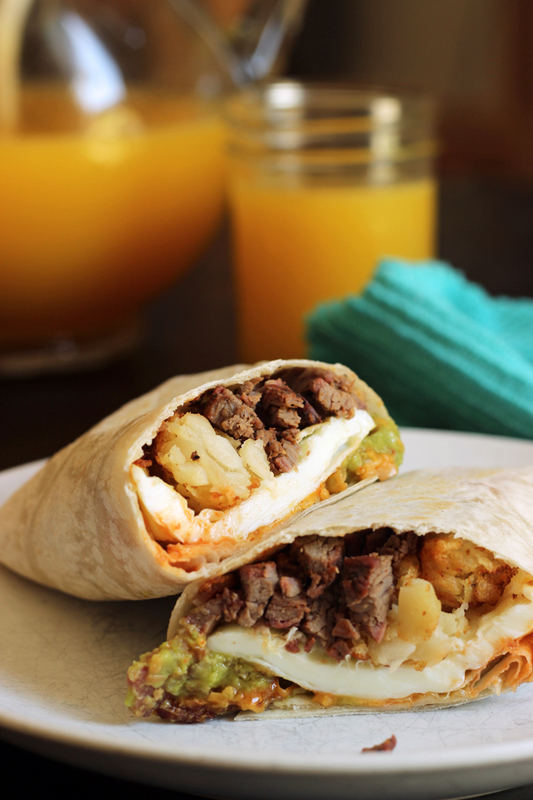 Assemble the breakfast burritos by layering on a tortilla: tater tots, carne asada, bacon, sausage, eggs, cheese, hot sauce, and guacamole. Roll up and crisp on a hot griddle, if desired. Devour as soon as possible. Because of the msg? Not to mention it’s really expensive. $ 9.55 for 14 oz? Ouch!